Arguably, the most consequential moment of the nascent Trump administration will take place later today when Congress Votes on the first iteration of the bill known as the American Health Care Act (AHCA). If the success or failure of the bill to this point is to be judged by its reception from policy thinkers on most sides of the political spectrum, it is already an unmitigated failure. Understanding the AHCA requires understanding the context in which it was created, its intent, and its ultimate effect. Discerning context is easy because these events have already happened an are a matter of record. Grasping the intent of the bill is a matter of some faith, but also manageable. But intuiting the effect of the AHCA if the bill passed is most certainly an act of God. The current hyperpartisan media coverage, with some notable exceptions, fails miserably at providing consumers anything but slogans to be used to deepen the divide the country and marshall outrage. Watching the current coverage, one is left with the very distinct impression that the Republicans have chosen to gut the ACA in order to give a tax cut to the rich and bankrupt the elderly and the poor. While I understand that Satan himself is said to have given birth to the Grand Old Party, this does seem to be an odd tactic for any political party that needs votes beyond the 1% Wall Street demographic to stay in power. Certainly, gutting Obamacare does make for poor optics. It was, after all, the program that valiantly attempted to both provide health insurance to the uninsured and lower the spiraling cost of health care. I know this because I cheered these words as they left the former President’s lips a long eight years ago. The reality of Obamacare was a far cry from the vision. I have written a fair amount about mandates buried in Obamacare that made life challenging for physicians, but from a patient standpoint, the major complaint was that it was just too darn expensive. A nurse I work with has a Obamacare bronze plan with a very high deductible and and a premium that he could buy an iphone a month with. He hasn’t seen a primary care physician since he has had the plan, because the deductible ensures that he will be responsible for the entire cost of the visit as well as any routine bloodwork at chargemaster inflated hospital prices. There are many lessons so to learn from the last eight years of health care policy making, but a particularly salient one is that insurance turns out to be a complicated business better left to professionals than politicians. Insurance is expensive for a variety of reasons that certainly relates to band-aids in hospitals being worth their weight in gold, but beyond the high dollar unit cost of health care, fundamental problems with policies that regulate the insurance plans were baked in to Obamacare. The major problem relates to a paucity of young, healthy members enrolling in the marketplace. Health insurance needs a large pool of healthy patients to pay for those that are sick. Unfortunately, getting young healthy folks to buy insurance is challenging. Healthy patients are young invincibles with thin bank accounts who prioritize data plans, smartphones, and cable plans that include ESPN and the Kardashians over health care. Getting someone to choose health insurance over the Kardashians is a tall order, and in the case of Obamacare, the plan was to use a stick in the form of a mandate to buy health insurance. Starting in 2010, all Americans choosing to gamble and not buy insurance were subject to a dollar penalty. With the mandate in place, the Congressional Budget Office (CBO) – responsible for predicting the actual effect of legislation – estimated that by 2016, 21 million people would be enrolled in the Obamacare exchanges. The CBO, in this case, wildly overestimated. The actual number was around 10 million. The 10 million that were signing up were also disproportionately sick and poor. The prized young and healthy stayed out of the exchanges, instead choosing to pay a penalty ($695 or 2.5% of income) that was much smaller than the yearly cost of paying for health insurance. As a result, premiums in the exchanges rose year over year as insurance companies scrambled to cover losses in the marketplace. Obamacare had a partial answer for this – subsidies from the federal government kicked in at 400% of the Federal Poverty Level (96k for family of 4 in 2017) to insulate relatively poor patients from these premium hikes. Of course, using subsidies in this manner is good for the patients who qualify and insurance companies, but not so good for the american taxpayer. In no small part because of significantly increased federal outlays for healthcare, national health care expenditures in 2014, and 2015 accelerated faster than the 10 years prior. Plans under the ACA were required to provide certain Essential Health Benefits which included prescription drug plans, mental health and addiction services, as well as rehabilitation services. If you’re a 27 year old with a few hundred dollars a month who wants to buy a skinny plan that doesn’t cover prescription drugs or mental health benefits – you’re out of luck. The individual mandate itself was more like swiss cheese than the Hoover Dam. Even at its most expensive, the penalty for not complying with the mandate was $695 or 2.5% of your income. So the penalty may certainly have been a deterrent to high income earners, but it did little to dissuade the less well off, young and healthy from choosing not to buy $400/month insurance plans that they saw little chance of using. There were exemptions galore from the mandate for hardships such as ‘experiencing the death of a family member’ (no documentation needed) that could be used to avoid the penalty altogether. Gaming the insurance market was easy. You could choose to stay out of the marketplace until you got sick. A 90 day non payment grace period meant you could go three months without paying your premium. Get sick in those 3 months? Just pay the missed premiums and reenroll without any gap in coverage. An age rating band of 3:1, attempted to ensure that older, and sicker patients would pay no more than 3 times young, and healthy patients. In reality, this ratio was used to define the floor for premiums of the young and healthy as opposed to providing a ceiling for the old and sick. Donald Trump, having promised cheaper health insurance for more people very publicly met with insurance executives in the White House. While there isn’t much more than a photo-op of the visit, I am certain the conversations between the Tweeter-in-chief and insurance executives revolved around trying to deliver on the Trump promise to make health insurance cheaper by decreasing premiums. Little surprise then that many of the changes most vilified publicly are designed to help insurance companies who, at the end of the day, want nothing more than a large working profitable marketplace. Now, I’m not terribly sympathetic to the words profit and insurance company, but even I find the treatment of the changes proposed as pure political theater. Doing away with the essential health benefits to allow patients to choose skinnier, cheaper plans turns into being against the future children of America because health plans would be allowed to not include maternal care benefits. Similarly, the age band rating change designed to lower premiums in the young, instead becomes a tool created to raise taxes on the old. These issues still do not begin to touch the two areas of greatest concern in the AHCA: the number of individuals that will gain coverage, and the cost of premiums. The Republicans, and particularly Donald Trump assured the country more people would have coverage, and the health care delivered would be terrific. Clearly, no one talked to the CBO before making these promises. Many have high regard for the CBO – a group of non-partisan technocrats who use the best available evidence to make predictions of the future. Prized for their non-partisan brand, they are also alternatively vilified or lauded based on what is politically most expedient. In the case of the AHCA, the CBO believes premiums don’t appreciably reduce, and may in fact increase in the short term. They also strongly believe that the lack of an individual mandate means even fewer younger and healthier will sign up for the program – thus recreating the problem of adverse selection that plagued the Obamacare markets. Getting the estimates right on millions who would enroll is critical to assess the impact on premiums. The fewer people that sign up, the higher premiums are. The CBO’s projection of enrollment in the past are instructive, and this nice chart from Avik Roy’s FREOPP.org demonstrates the grand difficulty of predicting whether Jim and Mary in Altoona will sign up for health insurance whether you’re partisan or not. This is even more complicated by the fact that many of the Obamacare enrollees were covered under an expansion of Medicaid – 19/31 states rejected medicaid expansion in the past, and estimating the future of how states will respond to medicaid rules reminds of the time I tried to play ping-pong on a windy day. I gave up – but I guess the CBO isn’t allowed to throw its hands up in the air and walk away. The effect on premiums is thus even harder to predict. The CBO estimates that average premiums in the individual market will increase prior to 2020 and decrease after – precisely because they believe taking away the individual mandate will induce ‘fewer comparatively healthy people to sign up’. These estimations are, of course, fraught with assumptions. Take this next, pretty series of graphs by Avik Roy, a prominent conservative health policy wonk. The lines in this figure represent the net cost to the patient after ACA subsidies or AHCA subsidies that go to insurance companies to lower the burden of premiums on patients. The simpler green line represents the current (perhaps already dated?) GOP idea to have a flat tax credit that varies with age, but doesn’t rise with income or geographical area as the ACA did. 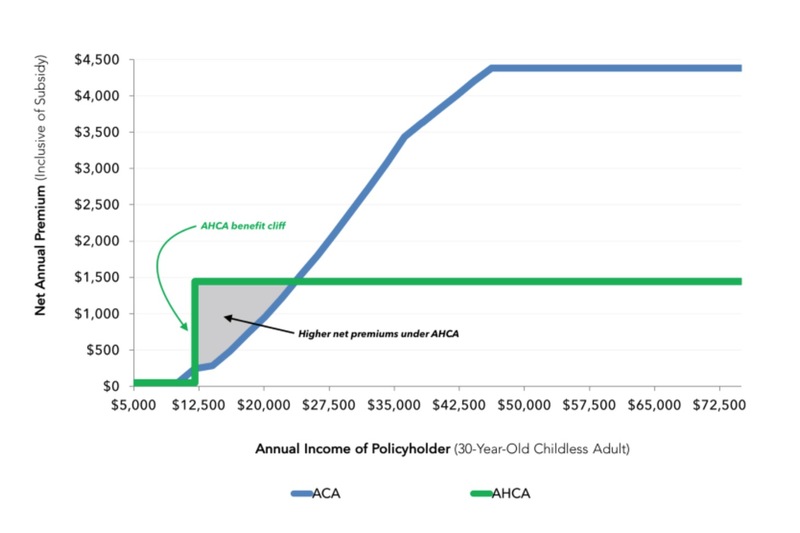 It would appear from the graphs that the AHCA is a loser, especially for older and poorer americans. Studying these graphs tells you why so many different ideologies are upset by this bill. The liberals are upset because this appears to shift costs from younger, healthier, relatively better off consumers to older, and sicker consumers. Pure conservatives and libertarians are hopping mad because the bill preserves subsidies from the tax payer to third party payers (insurers). But it should be clear that these predictions and analyses are fools missions. It should be obvious that the strength of these assumptions that predict enrollment to the nearest million and premiums to the nearest dollar have a flip of a coin’s chance of being correct. If young and healthy patients flood into the marketplace, the average premium falls greatly, and if far fewer than even the CBO estimates stay out of the marketplace, premiums will be even more expensive than what’s predicted. If all my decisions on therapy for a patient were based on this quality of evidence, I would quit. None of the analysts with very strong opinions on either side of the debate cop to the tremendous uncertainty baked in to all of this. The large majority of opinion-holders hold their ideology sacrosanct, and gleefully and selectively pick up ‘data’ that falls off the garbage truck of what passes for evidence in health care policy today. The lesson being missed in all this may be that the health care policy you should support is the simple kind – the one that gives maximum flexibility to the two most important players in the health care tangle: the patient and their doctor. Seems we have evolved into a coalition style variant for Federal governance. Its hard not to imagine that the true sources of political capital originated from the land of “Complex Healthcare” institutions. A future story to be told, to be sure. The true elephant in the closet continues to be ignored: the high cost of our nation’s healthcare industry. Parkinson’s Law continues unabated, at least for now. More importantly, the quality of our nation’s state of health continues to worsen. And, our nation’s humanitarian and scientific determinants for HEALTH continue to worsen unabated. I’ve read that 75%-80% of our healthcare costs are attributable to chronic illness and its management including virtually all of my own claims. I wonder about the extent to which patient non-compliance not just with respect to prescription drugs but also adhering to advice to stop smoking, drink in moderation, lose weight if appropriate and get some moderate exercise even if it’s just walking exacerbates their disease or condition and the cost of treating it. The best doctors in the world can’t make patients take their drugs and follow other advice and recommendations. No, but we can design tax policy to shift the culture. Tax sugar, fat, calories, stop subsidizing corn and subsidize fresh fruits and vegetables. This has to be a culture change. Some communities are attempting to tax soft drinks, but this needs to be national. Spend those taxes on health care. So what are those rates in other industrial countries with government run/controlled health care? Do Canadians have less chronic illness? Certainly their diet/exercise is pretty much the same as the U.S. Barry has stated in the past that our use of the system is about the same, but it’s our prices that make us spend way more – and make care so unaffordable to more people. Why is it that we want to control costs by denying care to poor(er) people??? BREAKING: Trump throws Ryan under the bus. Imagine my surprise. Not exactly, he’s blaming Democrats in his alternate universe. If Repugs have a ounce of intelligence they’ll now work with Democrats to fix the problems with the ACA without tossing millions “under the bus” and off coverage. I’ve seen it written today about how Ryan ostensibly “played” Trump. I stand by my characterization. Trump drew a line in his Mar-a-Lago sand trap and made Ryan walk the plank (to mix metaphors) with that still-moist AHCA turd, knowing full well it didn’t have the votes (few of the Goopers even read it), notwithstanding the huge GOP House +44 seat margin, (and, knowing it would be would be DOA in the Senate anyway). And, blaming the Democrats, yeah, THAT was rich. Try to imagine how much they care about that predictable, no-legs, toss-away line. Been swamped at work so missed some of the details on this, but I finally found out that their goal was to pass this on the anniversary date of the ACA passage. Rather than craft a bill that could get support from their own party, they have the numbers, they made symbolism their priority. What a bunch of idiots. Steve, do you read other people’s minds? Assuming the dates are the same, correlation is not causation.